Since Dragon Door introduced America to kettlebells in 2001, this amazing "gym in one hand" has been redefining our nation's strength and conditioning landscape. Now, personal trainers who incorporate kettlebells into their programs have watched their client base explode. Previous clients have flocked back, attracted by undeniable gains in strength—and loss of body fat! Kettlebells have opened up whole new vistas of training success for personal trainers and their clients alike. Chiropractors, massage therapists, physical therapists, physicians, sports coaches, you name it, have also eagerly embraced the kettlebells uncanny ability to rehab injuries—in particular, back and shoulder injuries. And, of course, athletic coaches at the school and professional level have been falling over themselves to ensure they and their athletes gain the competitive advantage almost guaranteed by proper kettlebell training. Then, the police and military — whose very lives can depend on their physical strength and conditioning levels — have jumped on kettlebells as the quick and very handy answer to fast and permanent strength and cardio gains. With the kettlebells growing popularity as the exercise tool "that does it all"—be it for the professional athlete or simply average fitness-Joe looking for a more effective workout- there's a rising demand for highly skilled and competent kettlebell instructors. 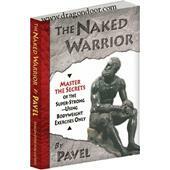 Dr. Dennis Koslowski, Chiropractor, ART specialist and the first American to win Olympic Medals in Greco-Roman Wrestling (Bronze in 1988, Silver in 1992), has stated "If I could've met Pavel in the early 80's, I might have won two Gold medals." "I'm a training specialist for the Florida Dept. of Law Enforcement. Since attaining RKC status, I've been able to train the head Officer Survival Instructor in kettlebell techniques; and have also convinced him to add kettlebell workouts to our Special Agent Training Class. 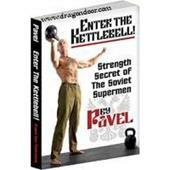 "I have been a personal trainer since 1987, and frankly, I've never seen anything like the excitement generated by Russian kettlebells. This age-old art has infused my business with a new level of passion I've never seen before, and it's spreading like wildfire. Let's start with the financial benefits. I've more than doubled my personal training income since becoming Russian kettlebell certified, which has enriched my career as well as my personal life. This past Thanksgiving I was actually able to leave the gym behind and whisk my wife away on a rugged 2-week trip to Costa Rica, something that simply would not have been feasible before. December 2004 was one of my busiest months ever. Business was up, and clients were in a generous mood. My wife couldn't help but note the huge increase in holiday tips I received, which nearly covered the cost of our Costa Rican adventure! "What do you attribute it to," she asked. "The economy isn't that great." I immediately summed it up in one word: "KETTLEBELLS!" The bottom line is, my clients were feeling generous because they were grateful for what they'd gained (and lost!) over the past year! I've had incredible results across the board with all my clients, male and female, since kettlebells entered the picture. One of my longtime clients lost 26 pounds in six weeks. His sister and her husband, visiting from Ireland over the holidays, were totally amazed at both his fitness level and this odd "new" form of training. A newer client lost three dress sizes and really toned up in the span of two months that she had to prepare for her wedding. 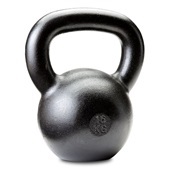 A masseuse called me to inquire about kettlebell training because she couldn't help but notice the change in muscle tone our mutual client had achieved. Success stories like these—and there are many—made for a lot of very happy and fit clients with a renewed interest and commitment to training. Needless to say, these kinds of results also brought a lot of new business my way last year. I now have a physical therapist sending me clients because of the improvements he's seen in his patients' strength and mobility after sending them my way. "Beyond the professional gains, Russian kettlebells have really benefited me on a personal level as an athlete…"
I am 46 years old and have pursued a very rugged and adventurous outdoor lifestyle for as long as I can remember. As a result, there were a few old injuries that had really started to dog me in the past couple of years. Since becoming KBC certified, however, things have changed. I have made amazing strength gains, but perhaps more importantly in terms of improving my quality of life, I have increased the flexibility and joint mobility in my hips and shoulders tremendously. Both have been invaluable in terms of increasing my enjoyment of rock climbing, skiing, and hiking, not to mention improving my performance exponentially! 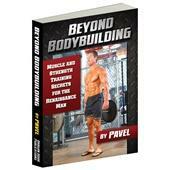 My endurance, strength-to-weight ratio, core strength, static strength, grip strength, and flexibility are all markedly greater than before I started training with kettlebells and incorporating Pavel's other techniques. "Since attending the April 2003 Kettlebell certification my business has expanded to the point that my wife and I were able to open up our own Fitness Facility in La Jolla , California in November of 2004. "I am the owner of a physiotherapy practice and strengthening is an integral part of recovery. Unfortunately, I have found that most conventional strengthening systems are impractical for most of my clients for various reasons. I had excellent results personally with kettlebell training and felt that it would be applicable to my clients as they are available in a variety of weights. Like most everything I have experienced from DragonDoor, the course exceeded my expectations. 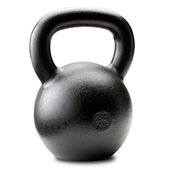 Since the course, I have successfully used the kettlebells for rehabilitation. I have also run up to three classes per week after work hours at a local gym because of the buzz that has been created. I should note that there have been no injuries in the past year and a half since I started teaching, which is remarkable considering many of my students are also clients who have been recovering from injuries. Although I have never advertised these classes, I am already busier than I want to be with teaching due to the word of mouth generated by my students. This exposure certainly hasn't hurt my physiotherapy practice either. "At last I can offer my clients a time-tested and effective anti-aging fitness program rather than vaguely telling them they need to strength train and stretch daily." The kettlebells have solved my previous dilemma of effective exercise prescription and I truly believe have started a lot of people who otherwise would never before participated in an exercise program down a lifelong path of better health and fitness. Former National Level bodybuilder, 1999 Powerlifting World Champ, Former Paratrooper. 2002 Body-for-Life Grand master Champion. Certified personal trainer, sport specific trainer, certified stretching coach. Motivational speaker for EAS transformation camps. Owner of personal training studio, featured in Muscle Media, 4 times. Outside magazine, various local TV networks, various newspapers. Former basketball, baseball, cross country, boxing and various other sports competitively. Trained athletes & clients for over 14 yrs. 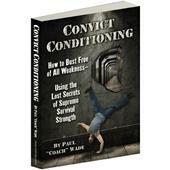 Train primarily HS and college athletes. 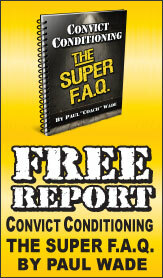 Have CSCS, NSCA-CPT, USAW Sports performance coach & USATF level II sprints/hurdles coach. Will have MS in exercise science in Dec 2004. Have coached and taught squash for last 4 yrs. Masters All-American Indoors — 60-meter dash. Play senior men's baseball. "RKC training has taken away my frustration with the traditional method of strength training, and has given me a direction of where to go. RKC has given me science, logic, invention, and creativity in strength training. Pavel's ability to guide a question in order to get an answer is amazing. I played fours years of college basketball. I am an avid golfer and participated in the state championship in high school. I am training to participate in amateur boxing. I skateboard, boogie board, rock climb and enjoy climbing ropes and doing the rings in SM. NSCA — CPT, Bronze medal/world record Goodwill Games 1994. Powerlifting bench over 500, squat over 700, at 230 bodyweight. Professional wrestling, bodybuilding, some boxing, martial arts. 10 years as a trainer and coach (sports med and HS strength coach) Track and Field sprinter — state champion in college. Specialize in online training and consulting. I have been an athlete all my life. From a nationally ranked sprinter as a youth to HS wrestling and football, to martial arts. Surviving the weekend and Pavel's stretching seminar. I've trained PTP style for over 3 years. Trained Canadian Olympic & World Cup Boxers. 1998- Ranked 6th in Navy Seal Super Fitness Challenge. Assistant strength coach - Kansas City Chiefs and Minnesota Vikings. CSCS since 1987. HBPE, PFLC, Former collegiate — head strength coach. 27 years as fitness professional — over 25,000 trained. Participated in the Honolulu Marathon and many other team and individual endurance events. Training interests lie in grip strength and dead lifting and related movements, aside from kettlebells for general strength and fitness. Played rugby at club level. Swam for provincial team. Bodybuilding style training background. 4th finish in provincial novice bodybuilding competition. High cross-country team, weight training in college for 2 years. 3 seasons rock climbing, cross-country bicycling (2000 mile trip), martial arts: TKD, Kung fu, Goju Ryo, currently practicing Aikido. Yoga/stretching since 1993; rolfing yoga, ashtanga and makko-ho meridian stretches. Kettlebells since 2002, instructor KC Goldberg Taichi and chigong since 1997. Former United States Marine, currently a fireman for the city of Indianapolis. Have a background in grappling and various self -defense systems. Receive a free two-year listing of your training-contact information on Dragon Door's website and watch the new customers pour in! Somehow, still not sure if this certification is for you? Friday: 8:30 a.m.-1:00 p.m. & 2:00 p.m.-6:30 p.m.
Saturday: 8:00 a.m.-1:00 p.m. & 2:00 p.m.-6:30 p.m.
Sunday: 8:00 a.m.-12:30 p.m. & 1:30 p.m.-4:30 p.m. This workshop limited to 30 participants.